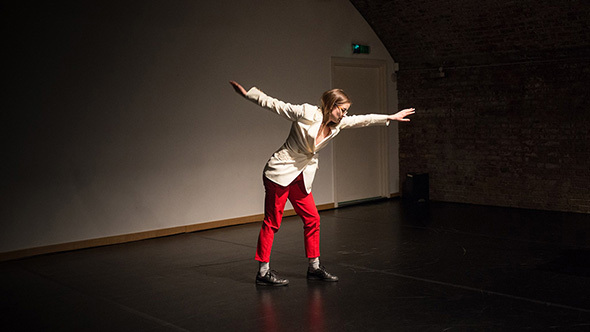 The London Contemporary Dance School’s evening of Postgraduate to Professional dance, now in its third year, offers choreography from a current postgraduate student (Marcus Foo), alumni (Feet off the Ground Dance, Helen Cox, and Eleanor Sikorski) and faculty (Mickael Marso Riviere). As an evening of dance it falls somewhere between a showcase for the school and a choreographic platform, but its predictably uneven quality makes it an unwieldy concept. The first work, Éter, by Feet off the Ground Dance, an all-female group who describe their mission as ‘contact improvisation and partnering for performance’ is just that: contact improvisation and partnering for performance. But where is the performance? Beginnings, as Ben Duke (another graduate of London Contemporary Dance School) quips at the beginning of Paradise Lost as he searches for his place in the text, are vital for capturing the attention of the audience. But the opening minutes of Éter, in which two women inch slowly sideways, on hands and knees, forehead to forehead, along either side of a diagonal shaft of light has little to recommend it but the contact. The lighting is dim and pulsating and the live score is a low-level wash of sound that makes the sensory compass unable to find its bearings. Most significantly the performance appears to extend class-based contact improvisation exercises on to the stage without any spatial framework. The action of Éter develops with two other women, but without the objectivity that an audience brings, the whole never takes on a performative quality. It is significant that the program note lacks any identifying feature of the work. Foo’s Automaton Animalia is another piece of choreography that starts in the mist and gets lost. The program note is telling: ‘If I look hard enough, if I could will my mind to look beyond the arch, I might still see it. Maybe it’s still there, just not really here anymore.’ There is an archway of crates we can see through a backlit haze, and five performers moving slowly, mysteriously as they dismantle it and reconfigure it. At least there is a visual focus, but the choreographic concept has no legs; it turns on itself with a score that fails to inspire it. Inspire is to ‘breathe in’ and education is to ‘lead out’, but here the breathing is restricted and the exit is obscured. Creation is the victim. I wrote about Cox’s de/construct after I saw it at Roehampton University’s Footprint Dance Festival earlier this year. Interestingly her program note has changed focus. ‘Reflect on a time in your life when you were in a period of transition. It is sometimes said that this space in between is the most creative, but also the most vulnerable. Using the dancing body, I move through this space, deconstructing routines and listening to the infinite possibilities of what lies between.’ But this version doesn’t take into account the organic, tree-like hemp dress she wears at the beginning, which ties her to the landscape of her original conception. Once she sloughs it off she is wearing everyday clothes that are closer to the idea of a dancing body exploring the creative space. Somewhere in between the two is the true nature of Cox’s work. Sikorski’s Comebacks I thought of later substitutes a quote from Shelley for a program note: “Our sweetest songs are those that tell of saddest thought.” The register is slightly off, for Sikorski’s ‘songs’ are not so much sweet as bitingly funny and the sadness is in her derisive tales of sexual misadventure. Comebacks consists of spoken texts about grunting male chauvinism, minimal musical accompaniment on a portable keyboard, to Sikorski’s vitriolic physical responses to her tales. The poignancy of the performance is as much in the wit of Sikorski’s ribaldry as in her self-deprecatory realization of her inability to think up the comebacks at the moment they were needed. The great strength of Comebacks is in its mastery of the anecdotal form and its scathing celebration of male failings. Riviere brings the evening to a close with his Éteins Pas, a reworked version of a 2009 piece he made at The Place during Choreodrome. It is inspired ‘by the idea of life after death, with many ideas coming from reading stories about out-of-body experiences.’ Riviere is bold at the beginning to remain supine and motionless for some time; all we hear is the air conditioning. Then he adds the smallest gestures of fingers and hands, ripples through his back to rise on to his knees and to stand, looking slightly sheepish as he looks at us for the first time as if saying, ‘I am not really supposed to be here.’ But having traced his revival with such sensibility, Riviere then subverts it with a display of breaking technique to a driving track by Armand Amar. It comes all too soon and all too easily; Éteins Pas in effect bridges two languages without acknowledging the bridge.